There really is no better way to take in the sights of London than by boat; and what’s better than an afternoon exploring the famous city as you float along the Thames? Enjoying lunch while you do it! Departing from Tower Pier, your cruise will include a two-course-lunch, with additional drinks from the on-board bar available to quench your thirst. With a cruise time of 1 hour 45 minutes, you’ll have plenty of time to explore the boat and the open-topped upper deck, where you can take in panoramic views of London’s famous sights. Watching the hustle and bustle of London life pass by, this experience will allow you to soak up the atmosphere of England’s Capital whilst you dine in style. 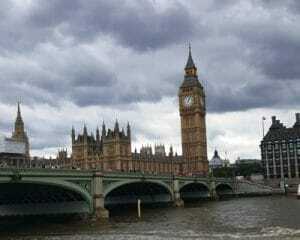 Attractions you are likely to spot along the way include the Houses of Parliament, Big Ben, The London Eye and more. Whether you are looking for a great day out, are wanting to treat a loved one or looking for the perfect gift for a couple, this unique lunch cruise is the perfect way to experience the heart of London, and enjoy a delicious meal in the process! To purchase child tickets please click here. The Lunch Cruise runs daily, throughout the year (except 19th-25th Dec, 30th & 31st Dec). Any dietary requirements must be made clear upon booking a space on a Lunch Cruise, at least 72 hours in advance of the experience date. Boarding begins at 11:30, with the cruise leaving at 11:45. You will return to the pier at 13:30. 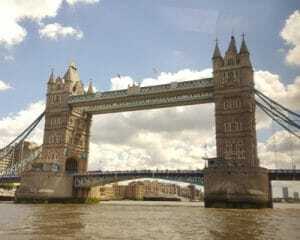 Participants: The Lunch Cruise on the Thames for Two is for 2 participants. 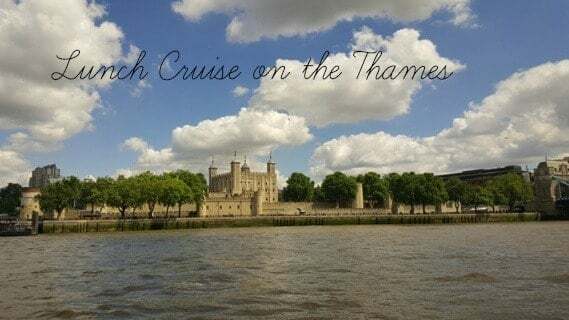 This Thames lunch cruise is for two participants. There is no required dress code for this Thames Lunch Cruise. This experience is not affected by weather conditions. Had an awesome time... friendly staff... well organised... food spectacular... shame the weather wasnât as good...! Definitely made me want to go on another cruise again. I booked this for my husbands birthday, it was really lovely seeing all the scenery. The food was delicious too. All in all a great experience. This was a birthday present from my son and his partner. I had a wonderful day, the staff were very pleasant and helpful. I would thoroughly reccomend. 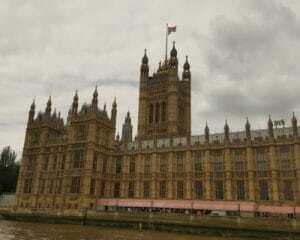 We enjoyed our lunch cruise on the Thames, it took in the Houses of Parliament down to Wapping. The food was very nice, the staff pleasant, helpful & gave great service. Would definitely recommend. Thoroughly enjoyed our lunch cruise. Lovely food, great service and all the staff couldn't have been better. Thank you! A beautiful time out! The boat was well laid out, the crew was professional and there was a nice lunch. The views were stunning and the commentary was both entertaining and informative. Definitely a trip well worth going on. We hopped on the Tube to Tower Hill station and made our way to Tower pier, which was very easy to find. Due to arriving early, we decided to pop into one of the various cafes surrounding the pier and grab a drink. Once it was time to make our way down to the boat, our group was instantly greeted by the Captain himself and the rest of the staff, as we climbed aboard the Citycruiser. After being shown to our table, that was right next to the window with a perfect view, it was time to set off. We started our journey by the Tower of London, setting off past the Shard, Gherkin and heading down the river through London Bridge. It was time to get our cameras out to start capturing London’s skyline from this unique angle. The next part of the trip was something we had all been looking forward to – lunch. 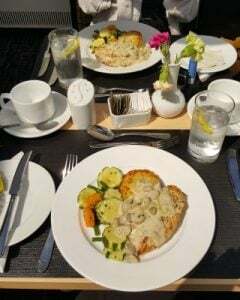 The set menu included- a delicious plate of chicken breast with cream of mushroom sauce, dauphinoise potatoes and a mixture of seasonal vegetables (vegetarian options also available). We enjoyed the views of Westminster Abbey, The Houses Of Parliament and of course – Big Ben, whilst enjoying our meal. Throughout our trip, we listened to the Captain’s live commentary of fun facts and historical details of each landmark. One fun fact is that it is illegal to enter the Houses Of Parliament in a suit of armour! 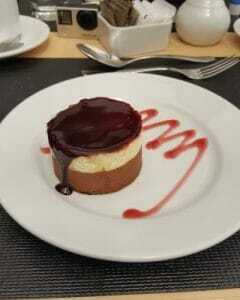 After some more sightseeing, dessert was served – a layered double chocolate mousse cake (perfect for chocaholics!). We then travelled past the London Eye and County Hall, where we decided to go to the top deck to get a better view. Despite the clouds, luckily for us it stayed dry and we could enjoy the remainder of the trip upstairs, taking in the stunning views. 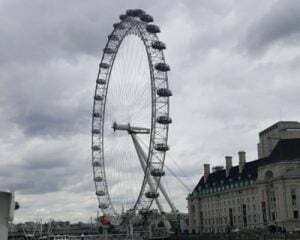 Before long the trip was over and we returned back to Tower Hill pier, with a full belly and knowing all about London’s history and its quirky truths! If you fancy having a fun day out in the city over a delicious lunch for two, this is the experience for you! Or if you’re looking for something a bit lighter, why not try the Afternoon tea cruise on the Thames for Two ? Yes. Customers are able to select a vegetarian option upon booking their Thames lunch cruise date. What time is boarding for the Lunch Cruise on the Thames for Two? The boarding time for the Lunch Cruise on the Thames for Two is at 11';30am.